The President of Italy has awarded Elizabeth (Liz) Maxwell of Lyttelton the ‘Ordine della Stella d’Italia’ (Star of Italy), a prestigious Italian state honour which brings with it the title of ‘Cavaliere’ (Knight). The honour recognises expatriates and foreign nationals who have made a significant contribution to the preservation and promotion of national prestige abroad, promoting friendly relations and co-operation with other countries and ties with Italy. HE Fabrizio Marcelli, the Italian Ambassador to New Zealand, presented Cav. Elizabeth Maxwell with the Order of the Star of Italy at a function in her honour at the Italian Embassy in Wellington on Friday, 16 November. HE Fabrizio Marcelli said, “Liz is a most deserved recipient of the Ordine della Stella d’Italia. 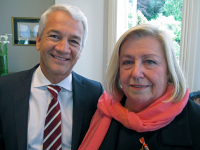 She was a longstanding and influential member of the Italian Chamber of Commerce in New Zealand Inc (ICCNZ). Cav. Elizabeth Maxwell first joined ICCNZ in 2004, serving as a Councillor and as its Vice President from 2007 to 2009. In 2010 she was unanimously elected President, a role she held for four years before standing down. She also served as Immediate Past President in 2014 and as Treasurer from 2014 to 2017. Liz thanked the Ambassador for hosting a function in her honour and the Embassy for the support it extended to ICCNZ during the period she was involved with the Chamber. She also acknowledged the support of the Chamber’s Councillors and members over that period. Cav. Elizabeth Maxwell is the principal and owner of ESP Ventures, a Christchurch-based business events solutions company established in 1998. ESP Ventures project manages business events, including facilitation of global buyer and exhibitor groups at international trade fairs, corporate meetings and incentive and loyalty programmes. Liz has worked with many top companies in New Zealand, Australia, the United States, the United Kingdom, Germany and Italy, project managing corporate programmes. She has a valued global network of suppliers and associates. Highly respected in her field, these national and international project management activities have helped her establish a reputation as a leader in this field. Original generation time 1.9868 seconds. Cache Loaded in: 0.0238 seconds.